Basic stress-relieving shapes to basically relieve your stress. Themed giveaways to hold onto...and squeeze. Who doesn't love animals? Especially animals with logos? Athletic departments & sporting goods stores: check here. Shop Our Promotional Stress Balls! In this increasingly stressful world, it's easy to feel like you might boil over at any moment. That's true for your employees and true for your clients. So why not help them out? Reach out to us at Pinnacle Promotions, and order some promotional stress balls — the stress reliever that also builds brand awareness. It's tough to keep your hands off these custom stress balls in shapes adorable, silly, and soothing. Middle managers need them, bosses "borrow" them, and kids love them. These stress reliever balls are perfect for everyone from the anxious intern to the slammed CEO, and on their desks these unique stress balls will be nearly as indispensable as a pen and a pad of Post-Its. That means your company's brand, look, mission, and message will remain top of mind. If you're sending your people into battle for a big contract, give them promotional stress balls shaped like tanks — they can squish them when things get tough, and they'll remember that you have their six. Taking a big gamble on a big business expansion? Hand out dice-shaped, custom squishy balls to spread the word about your winning ways. Asking your employees to toil through lunch to meet a crushing deadline? Give them imprinted stress balls that look like cheeseburgers. Choose from tons of designs, colors, shapes, sizes, styles, and themes — or, if all that variety and selection sounds stressful, squeeze a custom printed stress ball and leave it to us. Our dedicated account teams will help you find the perfect foam, latex, or polyurethane stress balls in bulk, printed with whatever best promotes your business and makes a great impression. Our top selling, high-quality promotional stress balls and toys come with low minimums, fast turnaround, 24-hour service, and the peace of mind that comes from working with Pinnacle Promotions. 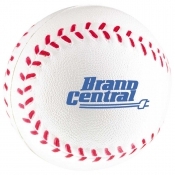 So pick up a bunch of squeezable logo balls for your team and your clients. Help them unwind, mellow out, and get back to business. They'll thank you — and they'll remember you.